When a gruesomely mutilated body trussed up in a distinctive fashion washes up on a lonely stretch of the south coast in the 1950s, DI Sonny Russell is soon struggling to unravel an intriguingly knotty puzzle. And as more bodies, similarly tortured, appear he begins to realise that, for some at least, the war is far from over. A trail of intrigue leads him to Europe where he befriends a French detective and together they set out to track down the villains. Blood on the Tide is a story of the sea and boats, murder and Nazis that begins in a sleepy coastal backwater and takes the reader through post-war France and Germany. The book features thinly veiled references to Rye and Rye Harbour. With Chris’s background in sailing, the boats in the book are accurately portrayed and the sea develops a life of its own. The notoriously fickle weather in the English Channel plays a big part in the tale, ranging from perfect sunny sailing weather to inconvenient sea frets to wild storms that only add to Sonny Russell's difficulties. 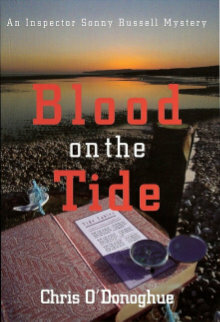 Blood on the Tide is the first in a series of detective novels featuring DI Sonny Russell. The second in the series is called Blood on the shrine and starts out in a snowy winter in a Buddhist retreat and will be published soon.